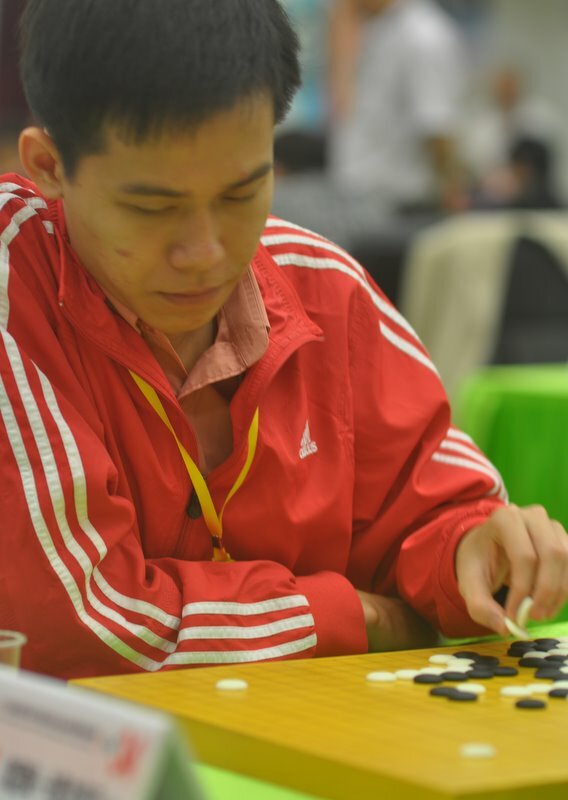 In Round 6, Tuesday’s afternoon round, China’s Qiao Zhijian (below right) immediately launched into the same Dosaku opening that he had used successfully in the morning round, once again playing his initial moves in less than one second each. The game took a similar course, with black (Qiao) securing considerable territory while white (Korea’s Lee Hyunjoon, at left) constructed a framework, inside which he tried to destroy an invading black group. At one point it looked as if he had a fair chance of catching the invaders, but running wild inside opponents’ frameworks seems to be Qiao’s specialty, and as in his morning game, he successfully brought his invaders to safety. Lee resolutely switched strategies and tried to win on territory, but this appeared difficult. Toward the end of the game Lee started a ko on the lower edge, but by this time all the black stones were connected into a single group, and white didn’t have enough ko threats. Qiao won the ko, started another (indirect) ko that eventually Lee had to win to avoid losing the top left corner, and won the game by 2.5 points. Serbia’s Mijodrag Stankovic needed less than 40 minutes to dispose of Australia’s David Bofinger (right). ‘Against a 5-dan opponent I chose to fight,’ said 2-dan David, ‘but it was the wrong fight to choose.’ The players from Chinese Taipei, DPR Korea, Japan, and Hong Kong successfully overcame opponents from Germany, the U.S. Belarus, and Singapore. DPR Korea’s Ri Kwang-Hyok will be the next to try to defeat Qiao Zhijian Wednesday morning. 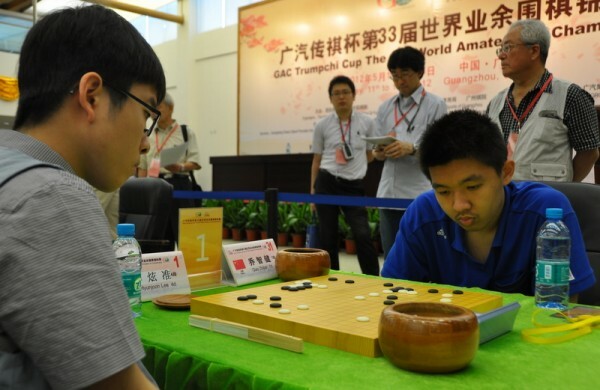 The low-teen duo from Chinese Taipei and Hong Kong are also in the five-win band, which means they are still in contention for the championship; they will play each other in Round 7. 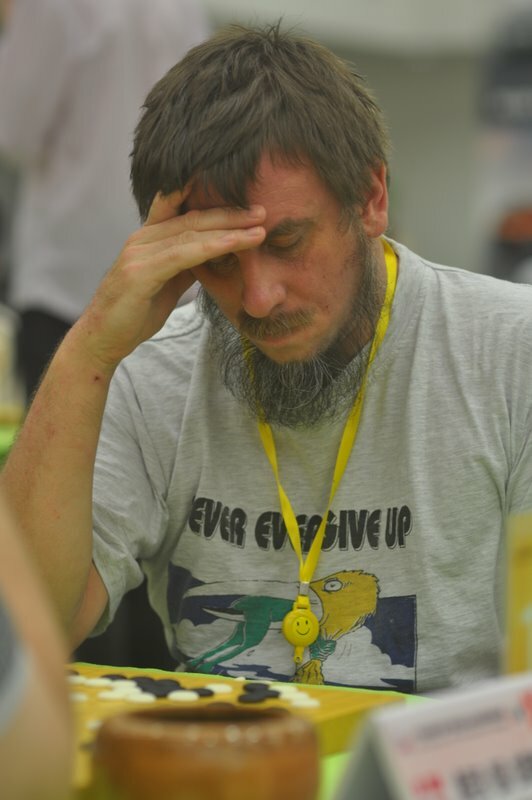 Another player in this band is Hungary’s Pal Balogh, who used the avalanche joseki to defeat Slovakia’s Pavol Lisy in Round 6, and will face the Korean Lee in Round 7. 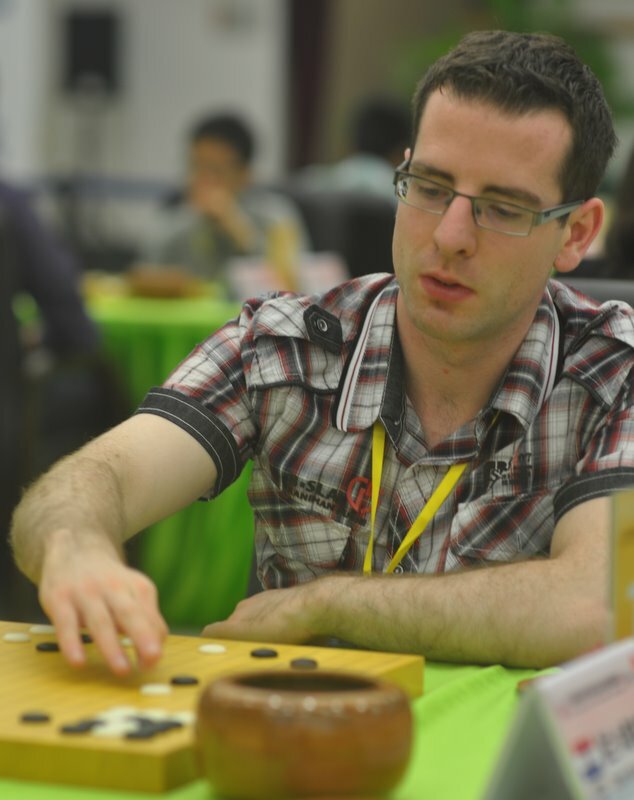 In other notable results, Vietnam’s Do Kanh-Binh (left) defeated Alexander Eerbeek, who said ‘I played like a 10-kyu.’ In a match between two players who reside in Canada, French seed Remi Campagnie downed Canadian representative Xianyu Li. In games matching Europeans against Latin American opponents, Italy’s Carlo Metta, Switzerland’s Felicien Mazille, and Argentina’s Eduardo Lopez picked up their third wins by defeating Costa Rica’s Luis Cajiao, Colombia’s Carlos Acuno, and Austria’s Lothar Spiegel, while Ireland’s Colin MacSweeney (right) picked up his second win by beating Brazil’s Nadeen Prem. And most notable of all, Fang Xiaoyan made this a perfect day for China by defeating Mongolia’s Bayarjargal Shartolgoi. - adapted from James Davies’ report on Ranka Online; click here for latest results and Round 6 online game records.